Krishna Engineering Works dealing on manufacturing and exporting Rewinder Unwinder. A genuine specialized supplier of Rewinder Unwinder. We are manufactures, exports & supplies Core Cutting Machine for cutting of paper core. 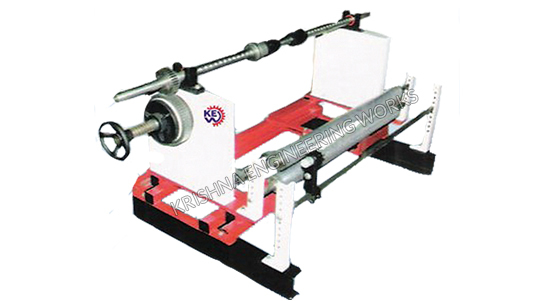 Also manufacturer Unwinder Rewinder System with Web Guiding System. Our machines are designed with a wide range of quality for long lasting heavy duty process, specially for cutting in different sizes from 12 mm to 1000 mm. Also, we are leading manufacturer of Unwinder Rewinder System with Web Guiding to control air pressure. High-quality rewinder and unwinder together for the heavy-duty process. Different types of Rewinders and unwinders for label, continuous label materials offer the processing of label rolls with large outer diameters with the high-speed process. All our Rewinder Unwinder units designed with features like user-friendly and multifunctional for different types of Roll form. Our label rewinders and unwinders are suited for inside and outside winding label materials. We manufacture Unwinding Machine or Rewinder Unit suitable for all types of machines like Rotogravure Printing Machine, Lamination, Coating Machine, Slitting Rewinding Machine, Extruder Machine, Textile Machine, Tyre Machine, etc.